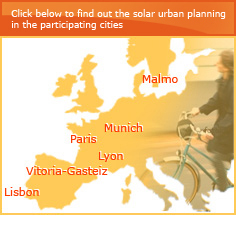 POLIS is a European cooperation project that focuses on implementing strategic town planning and local policy measures to utilize the solar energy capability of structures in European cities. Only a strategic approach by the municipality can enhance the expanding integration of small-scale, decentralized energy applications into the built environment. The aim of the project is to identify and evaluate current practices in solar urban planning, and unite the key responsible parties of this process to create a more cohesive planning and legislation practice for solar developments. The physical structure of a building and its position within the urban pattern is clearly integral to its solar energy capabilities. Availability and orientation of external surface area is a crucial factor in the design of active solar systems and also important for the reception of passive solar energy. More than any other renewable energy integrated solar energy relies on the qualification of the built environment. To ensure the viability solar energy for new structures in the urban environment, certain requirements need to be included in development planning and building legislation. Several instruments are available to promote solar energy such as municipal agreements or private law commitments. Existing buildings should also be guaranteed consideration for the installation of solar energy systems. A comprehensive knowledge of the style and structure of these buildings is essential to establish strategic planning to unlock their solar potential. Through the cooperation of those cities that are currently engaged in solar urban planning, the mobilization of solar urban potential can be promoted at a local level. Since municipalities are the key actors in the process of urban planning and local initiatives it is important that the planning departments of towns and cities be intrinsically involved in the POLIS project.